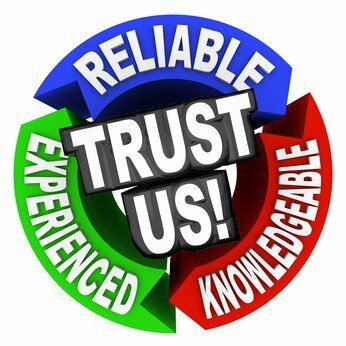 Trust is an important factor in selling more. If you don’t trust the sales person you usually do not buy – even if the product or service was exactly what you were looking for. When you are face-to-face with a sales person you tend to use a lot of body language analysis to help you determine whether or not you trust them. You are constantly on the lookout to see whether or not they are a “slimy” sales person or whether they are genuinely trying to help you. You also listen carefully to what they are saying to see if they know what they are talking about. Of course you have no way of really knowing. After all you do not set them an exam or some kind of test. So, what you are really checking is whether or not you “think” they know what they are talking about. In other words it is all about your perception of their knowledge – not their actual knowledge. If you think they know their stuff, then you buy. Online it is much the same. If we think a website has knowledge of the area, industry or topic, then we buy from them. But how do we measure that knowledge? After all, there is no body language to go on, no listening to what they say. Instead people tend to look for how much material the website has that is NOT related to sales. Visitors look for web content of all kinds – blogs, news items, press releases, videos, podcasts, downloads – you name it, they look for it. But – and it is a big but – they do not necessarily want to read it. What they are looking for is “how much” you appear to know. People “weigh it by the pound”. If you have lots and lots of non-sales content on your website then you “must” know what you are talking about; it is perception at play. Your website visitors are not testing your knowledge – they just want to be reassured that you do know the field and their assessment of that is by “weighing” the non-sales content on your website. Loads of it? Gosh you must be knowledgeable. Psychological studies of trust show that apparent knowledge is an important factor in deciding whether or not to accept the individual or the business. So, in order to increase sales on your website you need to make people think you know what you are talking about by adding lots and lots and lots of additional – non-sales – content. Sites like Asos.com, for instance, have seen substantial sales increases alongside the publication of their own fashion magazine as well as several different blogs. The more they add content, the more their sales go up. So if you want to see your sales rise too, your commercial website needs to have plenty of non-sales content that demonstrates you know your subject area.